Angara A5 is a heavy-lift launch system part of the Angara family of launch vehicles built and operated by the Khrunichev State Research and Production Center. The Angara family consists of light, medium and heavy lift vehicles to cover all types of payloads. 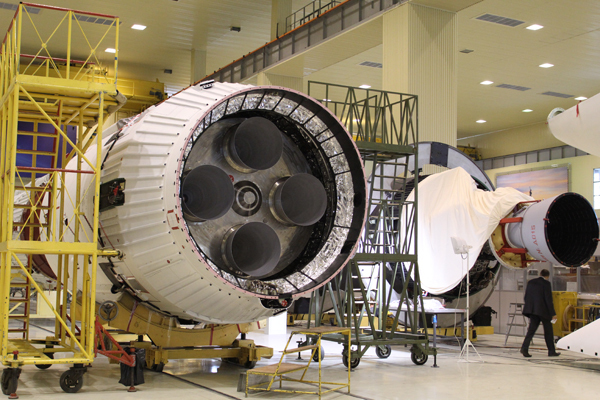 Angara A5 and Angara 1.2 are the only two members of the launcher family that are expected to enter operational service in the near future. With a payload capacity similar to Proton, Angara A5 will become the workhorse of the Russian space program as Proton is phased out in the 2020s. The A5 launcher will primarily deliver Geostationary Satellites to Geostationary Transfer Orbits, Supersynchronous Transfer Orbit or directly to Geosynchronous Orbit. The launcher will be used by the Russian Military and the Russian Space Agency while commercial launches will be marketed through International Launch Services. Angara uses a modular approach to create a number of different launch vehicle versions with different payload capabilities. The concept is centered around the Universal Rocket Module that builds the core stage of the launcher and can also function as a strap-on booster similar to the U.S. Delta IV Heavy and Falcon Heavy rockets that use three cores. Angara has been designed to use one (Angara 1.1 and 1.2), three (Angara 3), five (Angara A5) and seven cores (Angara A7) to create a range of launch vehicle options. Angara can fly as a two or three-stage launch vehicle. Different second and third stage options are being designed for Angara. As the heavy lifter of the Angara fleet, the A5 launcher can deliver payloads of up to 24,500 Kilograms to Low Earth Orbit. Using the Briz-M Upper Stage, Angara A5 can lift 5,400 Kilograms into Geostationary Transfer Orbit and directly insert payloads of up to 3,000 Kilograms into Geosynchronous Orbit. Payload capacity can be significantly improved by replacing Briz-M with a KVTK Upper Stage that is currently under development to use cryogenic propellants. Angara A5/KVTK can deliver 7,500kg into Geostationary Transfer Orbit and 4,600kg into Geosynchronous Orbit. Angara will be operated from the Plesetsk Cosmodrome and the Vostochny Cosmodrome that is currently under construction. A launch facility in Baikonur is also planned, primarily for launches of the Angara A5 vehicle, but the launch pad system for Angara can be used by all launcher versions except for Angara A7. The Angara A5 launch vehicle uses five Universal Rocket Modules – one as core stage and four strapped onto the core acting as liquid-fueled boosters – each powered by a single RD-191 engine. In flight, the boosters fire at full throttle while the core throttles down after liftoff to save propellants that are used after booster separation. 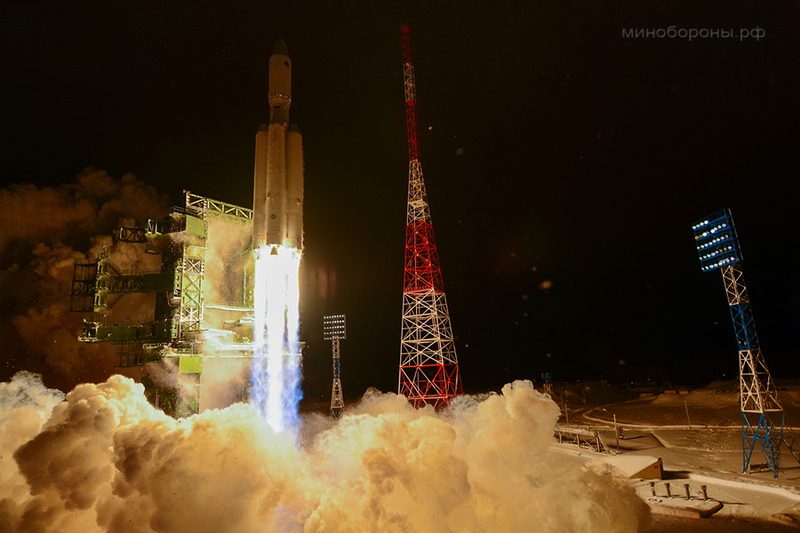 Overall, Angara A5 has a launch mass of 773,000 Kilograms standing 55.4 meters tall at a core diameter of 2.9 meters. With five URMs strapped together, the launcher measures 7.4 by 7.4 meters at its base. 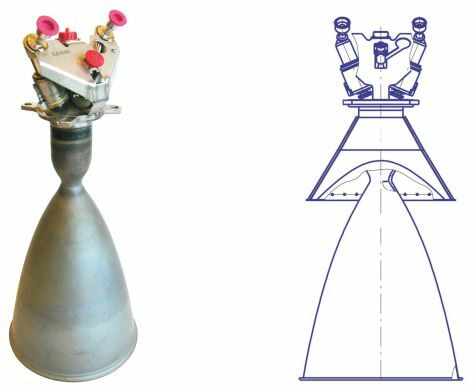 The Universal Rocket Modules used across the Angara family are identical with the exception that the boosters are fitted with nose caps while the core stage interfaces with the URM-2 stage via an interstage adapter that widens in diameter from the URM-1’s 2.9 meters to the URM-2’s 3.7 meters and also protects the engine compartment of the second stage. The rest is identical between the URM boosters and URM core stages (tank structures, engine compartment, electronics). When being used as a Core Stage with boosters strapped to its side, the URM-1 launches with its RD-191 at full thrust to create an appropriate thrust-to-weight ratio for liftoff and initial ascent before throttling down to 30% while the boosters keep on firing at full throttle. 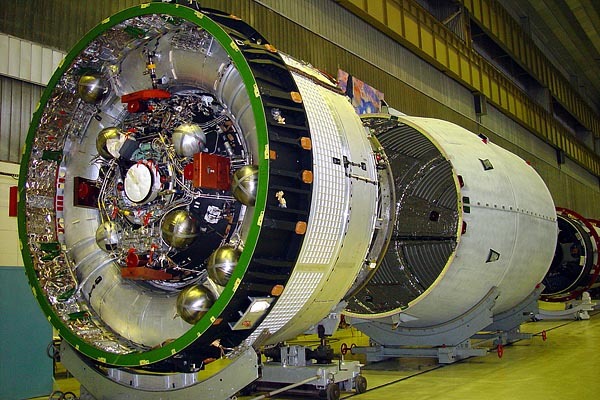 This allows the core stage to save propellants since Angara is not equipped with a propellant crossfeed (to be implemented as part of the evolution of the launcher family). At the point of booster separation at T+214 seconds, the Core Stage throttles its RD-191 up to full thrust to continue to burn until five minutes and two seconds into the flight using the propellants saved during the booster stage of the mission. When used as a strap-on booster, the Universal Rocket Module uses an aerodynamic nose fairing that is attached to the top of the vehicle, covering the top portion of the upper bulkhead of the Liquid Oxygen Tank. The nose cap utilizes light-weight composite materials. The caps are approximately 2.4 meters tall. 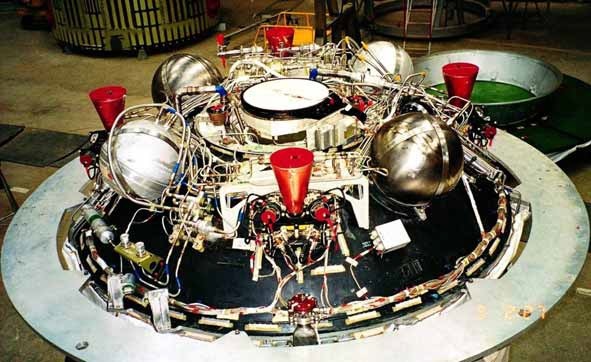 The URM boosters interface with the core stage at three points using spar booms that firmly hold the booster URMs in place secured to the core stage. Thrust from the boosters is transferred to the vehicle via the upper spar boom that interfaces with the interstage section of the core stage and the URM-2 upper stage. When being used as a booster, the URM fires its RD-191 at full throttle throughout the booster stage of the flight with the exception of a throttle down around Maximum Dynamic Pressure. Firing at full thrust, the boosters consume their 132,600-Kilogram propellant load faster than the core that throttles down quickly after liftoff. 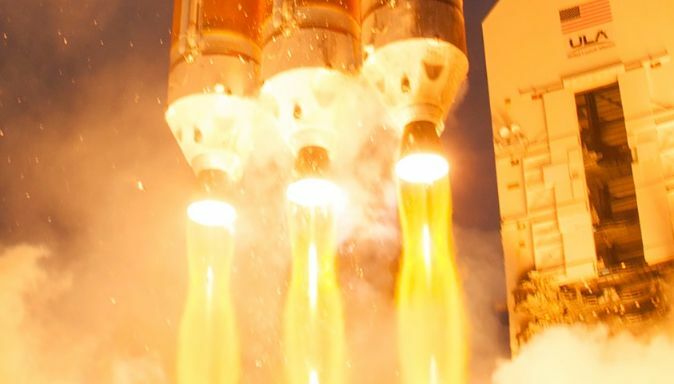 The boosters burn for 214 seconds before separating from the Core Stage that then throttles up for the rest of its burn – using propellants saved during the boost stage for a total burn time of 325 seconds. Separation of the boosters is accomplished using pyrotechnic bolts that disconnect the spar booms between the boosters and the core stage. Solid-fueled retrorockets are fired to ensure a clean separation without re-contact between the boosters and the core stage. The Universal Rocket Module is common across the entire Angara family – it is used as Core Stage and can also function as a strap-on booster. Being the smallest of the family, Angara 1.2 uses only one URM acting as first stage. The URM is 25.7 meters long and 2.9 meters in diameter featuring the common structure with the oxidizer tank located above the fuel tank. The URM, when fully fueled, has a launch mass of 141,500 Kilograms with an empty mass of just under ten metric tons. URM uses Liquid Oxygen as oxidizer and rocket-grade Kerosene fuel, stored in tanks consisting of hemispherical bulkheads and cylindrical sections. Aluminum alloy is used to manufacture the tanks and the URM uses composite materials in its interstage and instrument bay utilizing lessons learned from improvements of the Proton rocket that allow Angara to make use of production techniques creating light-weight components. The LOX feedline is routed on the exterior of the Kerosene tank to reach the engine compartment. The two tanks use individual bulkheads, creating an intertank area which is used to accommodate various instrumentation and control equipment. Spherical Helium bottles are located inside the Liquid Oxygen tank to be submerged in LOX to improve gas storage efficiency. Helium is used for tank pressurization in flight, being heated up and fed to the tanks to keep them at the proper pressure levels. Helium loading begins once the bottles are submerged in Liquid Oxygen in order to be chilled down to accommodate the Helium. The Universal Rocket Module is powered by a single RD-191 engine which is a one-chamber version of the RD-171 engine used on the Zenit rocket that is based on the RD-170 designed for the Energia rocket. The NPO Energomash RD-171 had already been converted to the two-chamber RD-180 currently used on the Atlas V launch vehicle. 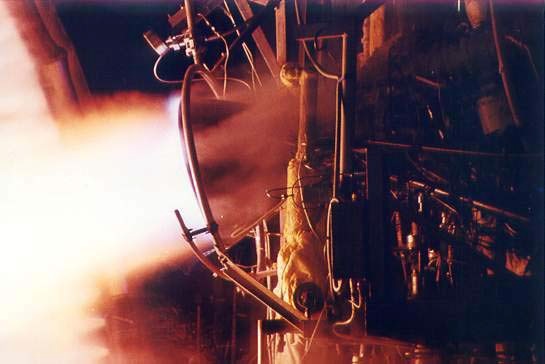 In the process of designing the RD-180, a study of creating a one-chamber version was conducted and the development of the engine was started in the late 1990s. The first test firing was conducted in 2001 and the total testing program included 120 firings with a cumulative duration of 26,892 seconds. 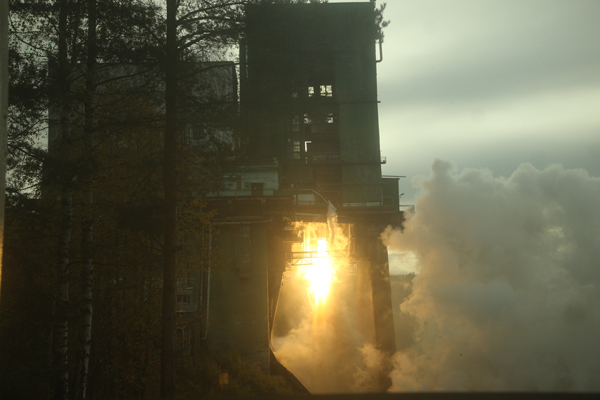 RD-191 completed its test program in 2011 and was certified in 2013 after another 18 firing tests. Overall, RD-191 is 3.78 meters tall and has a nozzle diameter of 2.1 meters. The engine has an inert mass of 2,290 Kilograms. RD-191 is attached to the launcher via a gimbal truss and a spacer to the shell of the lower fuel tank. RD-191 delivers a sea level thrust of 1,922 Kilonewtons (196,000kgf) with a specific impulse of 311 seconds. Thrust rises to 2,085kN (212,600kgf) in vacuum conditions with a vacuum impulse of 337.5 seconds. Through its design, RD-191 is capable of extremely deep throttling down to 27% of nominal performance. In flight, RD-191 will normally be throttled down no lower than 30%. The engine can also operate at 105% of rated performance for short periods of time which is utilized in contingency scenarios. 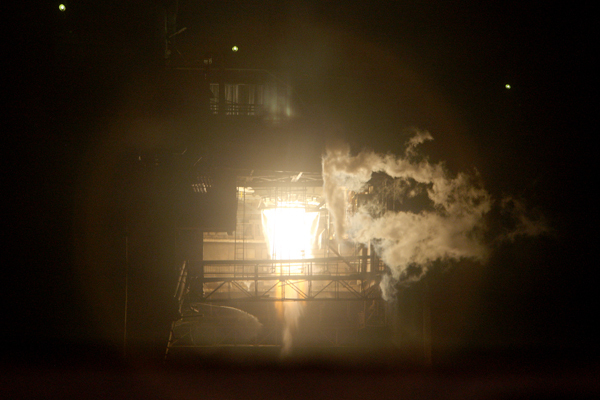 RD-191 uses a staged combustion scheme – burning all of the oxygen with little fuel inside a Gas Generator to produce a hot high-pressure gas to drive the turbine that powers the fuel and oxidizer turbopumps. The engine features boost pumps at the fuel and oxidizer inlets that operate at a lower speed than the main pumps and create an engine inlet pressure sufficient for the operation of the turbopumps. The fuel boost pump is powered by a turbine driven by the fuel tapoff from one main pump (fuel returns to the inlet) and the oxidizer boost pump turbine is driven by a fraction of the hot gas from the gas generator that then enters the LOX flow and condenses. All of the oxygen is then directed to the LOX impeller turbopump before reaching the Gas Generator. 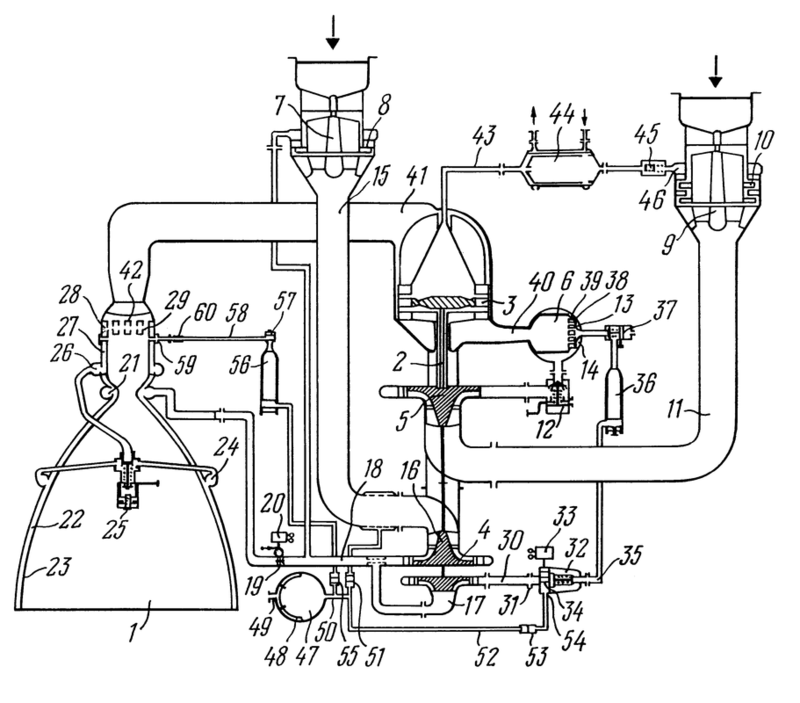 The Kerosene flow is directed into two portions using a two-stage turbopump. The Kerosene flow from the second pump stage (about 20% of total flow) is directed into the Gas Generator were it is burned in an excess of oxidizer, creating a high-pressure, oxygen-rich gas that drives the turbine. 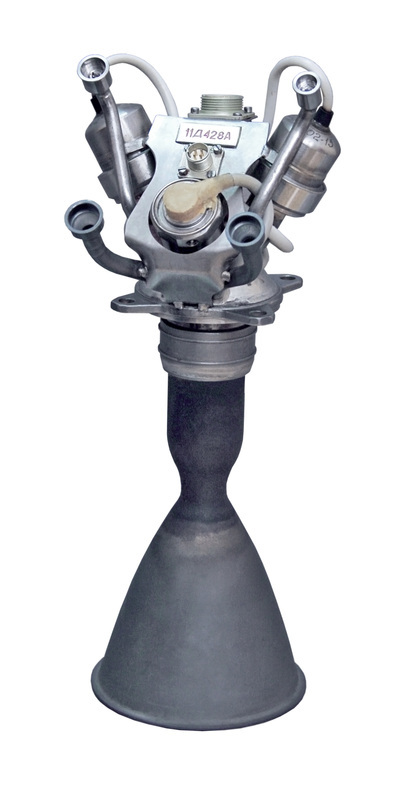 The RD-191’s LOX turbopump and fuel pumps are mounted on a single shaft. The turbine itself is a axial turbine using relatively thick blades and large clearance between the gas inlet and the blades to reduce the risk of damage. Nickel-alloys are used to endure the hot temperatures of the gas from the generator and the turbine uses cold oxygen for additional cooling. The Kerosene from the first stage pump is directed to the combustion chamber and nozzle where it passes through heat exchangers as part of the regenerative cooling scheme of the engine. The engine uses three cooling paths, one entering at the combustion chamber, one entering at the nozzle throat and the third one entering at the nozzle exit. After passing through the heat exchangers, the fuel is pumped into the combustion chamber where it is burned by the oxygen-rich gas coming from the gas generator. The mixture ratio is adjusted by a mixing valve located behind the first stage turbopump and the Gas Generator Temperature and engine thrust are regulated via flow valves ahead of the Gas Generator. RD-191 has a nominal mixture ratio of 2.63. 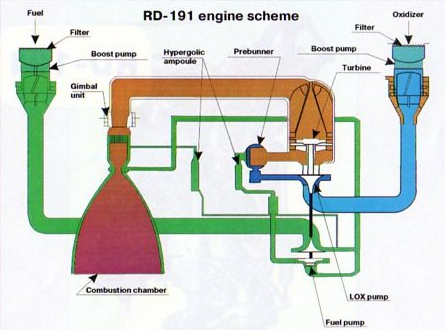 RD-191’s chamber consists of the mixing head, the combustion chamber and the nozzle. 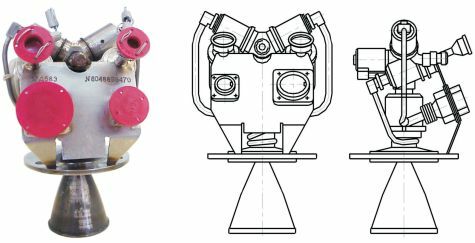 The injector uses small nozzles through which the components are introduced into the combustion chamber, forming a circular inner zone separated from an outer ring by protruding nozzles. The outer ring is divided into six compartments using protruding nozzles through which propellants enter the chamber. Fuel and oxidizer-rich gas alternates between the seven compartments. This design allows a stable combustion and avoids combustion instability or the creation of hot spots. RD-191 operates at a nominal chamber pressure of 262.6 bar. RD-191 uses a chemical ignition system based on Triethylaluminium (TEA) – a pyrophoric substance that immediately ignites upon exposure to oxygen. The TEA is stored in two closed ampoules – one in the fuel line directly ahead of the Gas Generator and one in the main fuel inlet to the combustion chamber. These ampoules use membranes to prevent the TEA from coming into contact with air. Using this ignition technique means that RD-191 can only be ignited once and requires extensive refurbishment after each ignition (replacing the TEA membranes and re-filling the ampoules). RD-191 uses a cardan suspension which allows it to gimbal +/-8 degrees using a hydraulic system driven by the gas generator exhaust. Engine gimbaling can only achieve control on the pitch and yaw axis requiring an additional system for roll control. For that, hot has from the RD-191 gas generator is released through four nozzles onto two aerodynamic control surfaces that deflect the stream of hot gas and introduce a roll component depending on their position. The control surfaces on the outside of the tail section are moved using hydraulic pressure. Being a modern engine, RD-191 includes various pressure, flow and temperature sensors that provide detailed performance data to the engine controller and flight computers. This allows a detailed monitoring of performance and extensive post flight analysis which can be useful in case of any anomalies. Also, telemetry is used in real time by the vehicle’s control system to adjust engine parameters like mixture ratio to optimize the performance of the launch vehicle via optimal propellant utilization. Additionally, engine telemetry is used to trigger launch vehicle abort modes. The Universal Rocket Module houses control system devices, telemetry measurement systems, power supply units and batteries inside the intertank section. The URM control system is common across the entire Angara family and uses heritage components from the Proton-M and Briz-M vehicles. Functions of the URM control system include control of the engine, monitoring of propellant consumption, monitoring of vehicle health, engine gimbal control, control of aerodynamic surfaces and telemetry transmission to the ground. The control equipment is self-contained and inertial using a modular structure that permits the addition of components at minimal difficulty. URM houses its own inertial guidance unit and also receives commands from the digital flight control system facilitated on the second stage. 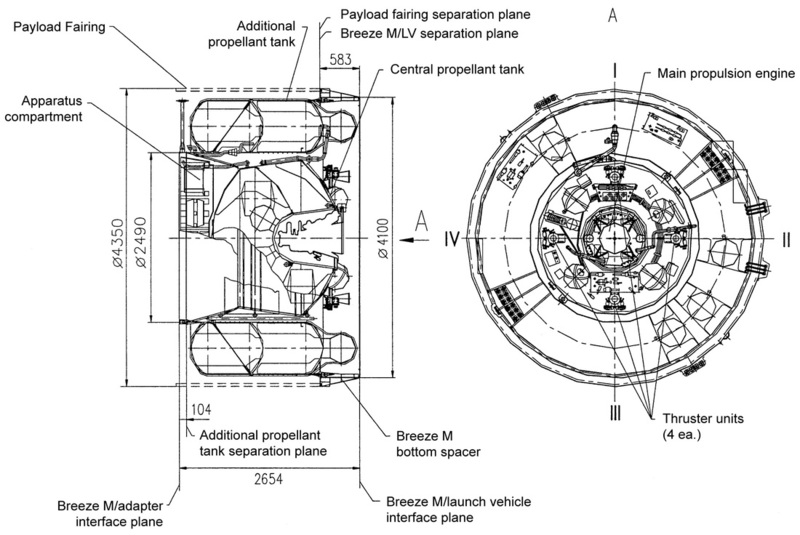 Unlike the Soyuz, Angara uses a cold-separation sequence between the URM-1 and the second stage instead of the hot-staging of Soyuz in which the RD-0124 engine ignites before separation to be able to push the spent Core Stage away. For staging on the Angara launcher, the RD-191 engine is shut down followed by a short delay before the pyrotechnic stage separation sequence is initiated, cutting the structural connection between URM-1 and the second stage. Next, four solid-fueled retrorockets are ignited on URM-1 located in the interstage area. These rockets move the Core Stage away from the second stage, clearing the way for engine ignition after a pre-programmed interval. The interstage structure is separated with the first stage and stays attached to it, thus exposing the second stage’s engine compartment. Soyuz uses a three-segment aft section that is jettisoned ten seconds into the engine burn meaning that Angara eliminates one separation event, which are associated with some risk. 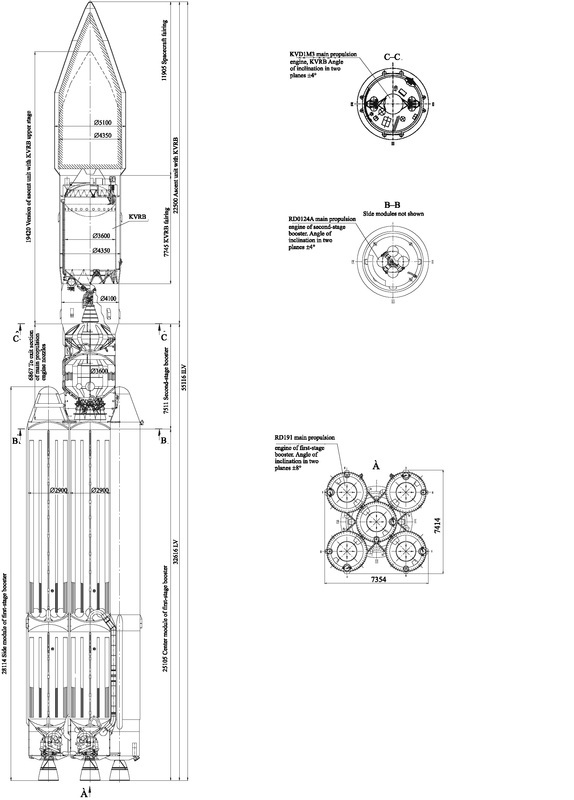 The second stage of the Angara launch vehicle family is a modified Block I which, in its original configuration, is used on the Soyuz 2 rocket. For Angara’s URM-2, the original diameter of the Block I is widened from 2.66 meters to 3.6 meters in order to significantly increase the propellant load of the stage by a factor of 1.4. In turn, the stage also grew about 13 centimeters in length due to the use of different bulkhead shapes on the propellant tanks. 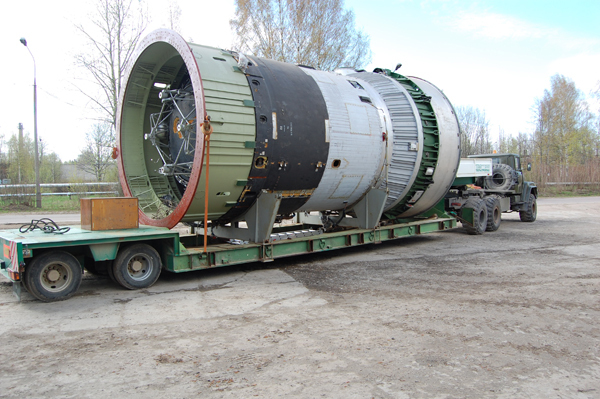 Measuring 3.6 meters in diameter, the URM-2 second stage is wider than the URM-1 first stage of the Angara 1.2 launch vehicle. The mass of this fully fueled second stage would be too much to handle for the RD-191 engine of the first stage which would not reach a sufficient thrust to weight ratio at liftoff. 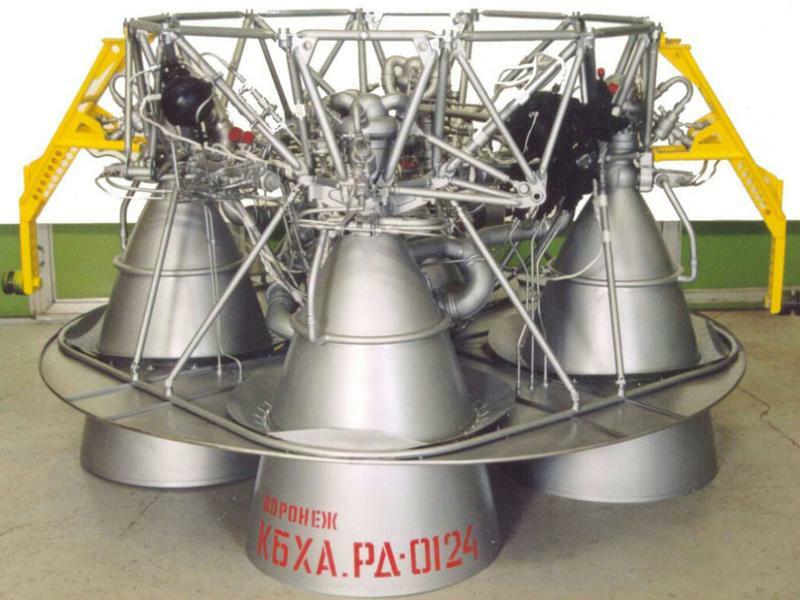 Originally, it was planned to launch Angara 1.2 with a reduced fuel load of 25,700kg on the second stage, but in 2009 the design was changed – introducing a different modification of the Block I only for the light-lift Angara 1.2 which would keep the basic Block I dimensions, but use the RD-0124A engine and Angara control systems. For the sub-orbital test launch, Angara 1.2PP will fly in its original design with the larger URM-2 stage to certify it for later flights on the Angara A5 rocket. The Universal Rocket Module-2 is 6.87 meters long and 3.6 meters in diameter with an empty mass of approximately 4,000 Kilograms. 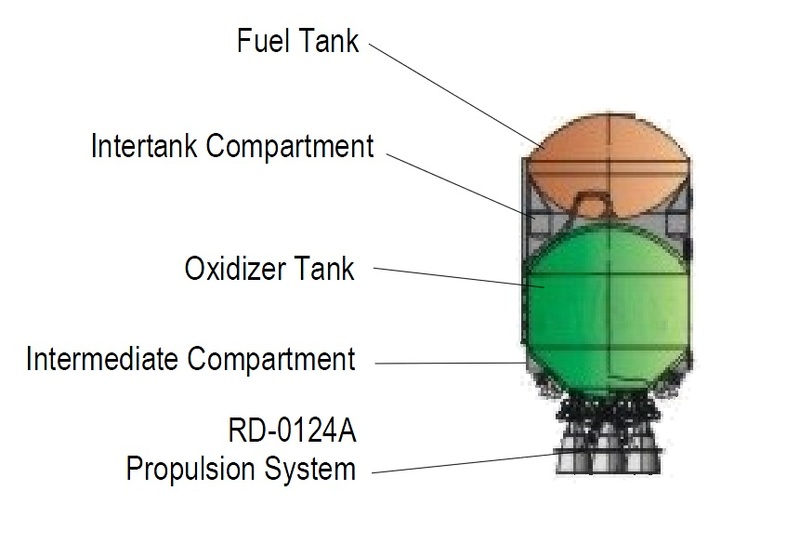 It is comprised of two tank compartments to facilitate the fuel & oxidizer tanks, an intertank section and a propulsion section in the aft of the stage where the RD-0124 engine resides. Overall, the stage can be filled with up to 35,800 Kilograms of propellants for a total launch mass of close to 40 metric tons. URM-2 uses aluminum alloy tanks – the lower tank facilitates 25,100 Kilograms of Liquid Oxygen using two hemispherical bulkheads with a cylindrical section in between, the Kerosene tank above the LOX tank holds 10,700 Kilograms of fuel consisting of two hemispherical bulkheads with a very small cylindrical section. The Kerosene feedline runs from the fuel tank down the outside of the LOX tank to reach the engine compartment. Using separate bulkheads, the tanks have a small intertank section between them that is used to house the flight computers and various control equipment. The conventional Block I uses a three-segment aft structure to protect the upper engine compartment portion and a part of the thrust structure and LOX tank during atmospheric flight. URM-2 uses an interstage adapter that narrows in diameter in order to fit onto the 2.9-meter first stage. During stage separation, the entire interstage separates to expose the engine compartment of URM-2 making any aft cover jettison obsolete. The URM-2 stage is powered by an RD-0124A engine which is essentially an RD-0124 from the Soyuz with two modifications – it uses a different structural design with a reduced number of components and lighter materials, reducing the overall weight of the engine by 24 Kilograms and improving its thrust to weight ratio. The second difference is the certification of the engine for a longer burn time than that of the Soyuz. This change comes into play because Angara uses larger URM-2/Block I stage with more propellants requiring the engine to burn up to 424 seconds. The RD-0124A is a four-chamber engine with a single Gas Generator and turbopump assembly supplying all combustion chambers. This engine is derived from the RD-0110, but is a closed-cycle gas-generator type engine. Overall, RD-0124A is 2.4 meters in diameter and 1.58 meters tall with an empty mass of 548 Kilograms. The engine delivers a thrust of 294.3 Kilonewtons (30,400kgf) and has a specific impulse of 359 seconds – a major improvement over the RD-0110 due to the use of a closed cycle and the higher chamber pressure of that design. 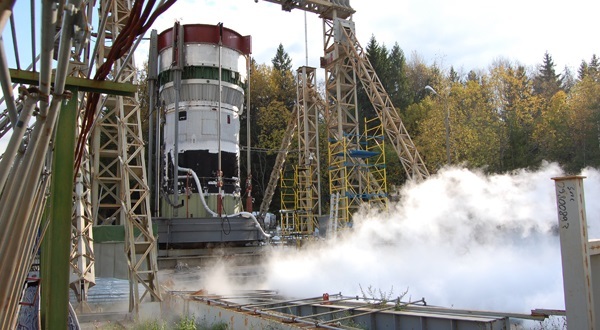 The RD-0124A uses a typical staged combustion cycle of Russian engines with an Oxygen-rich gas generator in which the entire LOX flow is combusted with a small portion of the fuel flow to create a hot high-pressure gas to drive the turbine of the engine which powers the turbopumps. The rest of the Kerosene is used for cooling of the chambers before being injected into the combustion chambers and burned with the oxygen-rich gas. Propellants entering the engine are pumped to the main turbopumps by separate boost pumps in the Kerosene and LOX lines needed to reach the proper inlet pressure of the main pumps. The turbo-axial boost pumps are similar in design – each unit includes one rotating part that consists of axial pump wheels and a hydraulic turbine, brazed or welded onto the pump wheel external diameter. The boost pump of the fuel inlet is driven by the high-pressure tapoff from the second stage Kerosene turbopump that re-enters the propellant inflow after passing through the turbine. On the LOX side, the boost pump turbine uses a similar scheme – it is powered by a fraction of LOX from the turbopump that also re-enters the feedline. RD-0124A uses a single shaft to which the LOX turbopump and a two-stage Kerosene turbopump are mounted. The shaft is driven by a turbine powered by the high-pressure gas produced by the Gas Generator. The turbopump housings and impellers are castings made from stainless steel. The impeller seals use bronze floating rings and the pump rotors employ a thrust balance system to ensure a proper axial balance. Both pumps use their respective propellants to lubricate and cool the turbopump ball bearings. The LOX turbopump operates at an inlet pressure of around 3 bar and an outlet pressure of 363 bar at a LOX mass flowrate of 56.7 Kilograms per second. For the Kerosene pump, inlet pressures of under 2 bar are sufficient to allow the pump to generate an outlet pressure of 366 bar at a flowrate of 23.9kg/sec. 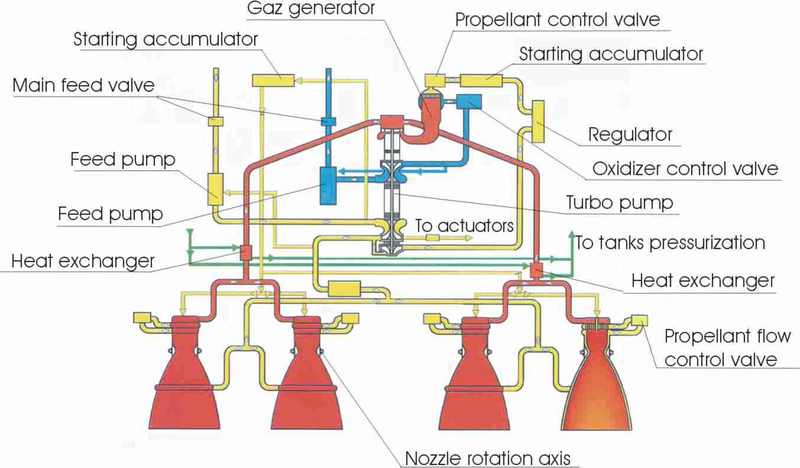 The entire LOX flow from the turbopump is passed through an oxidizer control valve to the Gas Generator where it combusts the Kerosene supplied by the second stage of the turbopump via a propellant control valve and a regulator that adjusts the mixture ratio that is normally set at 2.34. The Gas Generator produces a hot gas (973K) entering the turbine at a pressure of 319 bar and a flowrate of 59.85 Kilograms per second. Spinning the turbine at 39,000 rpm, the hot gas exits at a pressure of 185 bar, being directed on two paths that are then further separated into four lines to feed the four combustion chambers. While still at the two-line stage, the hot gas passes through heat exchangers to warm up the Helium gas supply for tank pressurization. Helium is stored in five spherical tanks submerged in the LOX tank and supplied to the engine to be heated up and pressurized in order to be able to pressurize the Kerosene and LOX tank via a number of pressure regulators and valves that ensure proper pressure levels are maintained. The Kerosene from the first stage turbopump is directed to the combustion chambers where it is used to cool the chambers and nozzles as part of two circuits per engine chamber. Afterwards, the Kerosene enters the combustion chambers where it is burned by the oxygen-rich gas generator gas supply. The chambers use a mixing head for a stable combustion process and operate at a nominal chamber pressure of 157 bar. Engine ignition is accomplished by injecting a pyrophoric substance into the Gas Generator and the four chambers that ignites when coming into contact with the oxygen. Once started, the combustion process is sustained by injecting the Kerosene into the GG and combustion chamber. As the gas generator starts spinning the turbine, the turbopumps begin supplying propellants to the Gas Generator and chambers to continue the combustion process. The pyrophoric igniter fluid is stored in accumulators just ahead of the Gas Generator and the chambers that release the fluid once the Kerosene pressure is sufficient to break the membranes. A small fraction of the Kerosene flow from the first turbopump stage is used to drive the hydraulic actuators of the engine that allow each chamber of be moved by +/-3.5 degrees in one direction. With four chambers being able to move along different directions, attitude control in pitch, yaw and roll can be accomplished. Following payload separation, the Block I stage uses a reaction nozzle that vents the oxygen tank in order to move away from the separated spacecraft. Angara uses a triple-redundant digital flight computer sharing a lot of commonality with the Proton launch vehicle. The control system features a digital onboard computer providing all vehicle commanding and guidance is provided by a 3-axis Inertial Measurement Unit. The control equipment provides vehicle control, telemetry and navigation for the entire flight and issues all vehicle commands autonomously. The equipment is located in the area between the two propellant tanks inside a small equipment bay. The guidance mode used is closed-loop. A high-precision three-axis gyro stabilizer provides exact attitude data to the digital flight computer and the avionics system also provides flight termination in case of a major anomaly during ascent. The KVTK upper stage is the medium-size single-stage Upper Stage in a series of cryogenic upper stages developed by Khrunichev for the Angara launcher family. 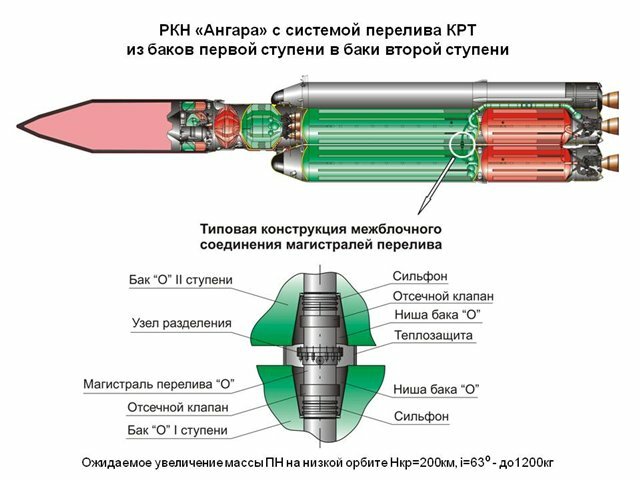 The smaller KVSK is used on the Angara 3 rocket while the bigger stages, KVTK-A7, KVTK2-A7 & VTK2B-A7 for Angara A7, carry more propellant and are too heavy for the A5 vehicle. Across the family of cryogenic upper stages, a lot of commonality exists extending the principle of the Angara family – using common components or scaled-up parts to create a simplified assembly and integration process and to cut costs. KVTK is a single-stage booster consisting of a propellant compartment, an upper equipment compartment and a lower engine compartment. 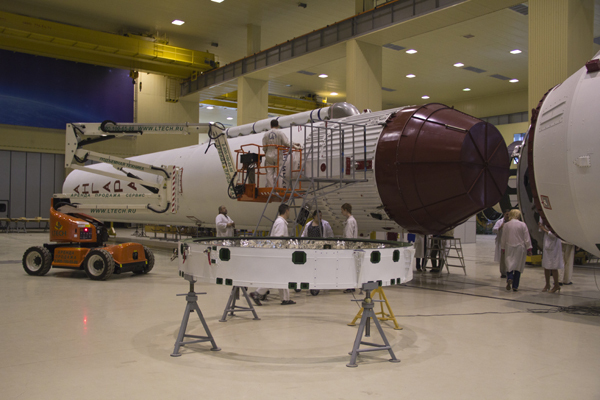 In its operational configuration, the upper stage is enclosed in the Angara payload fairing for protection. 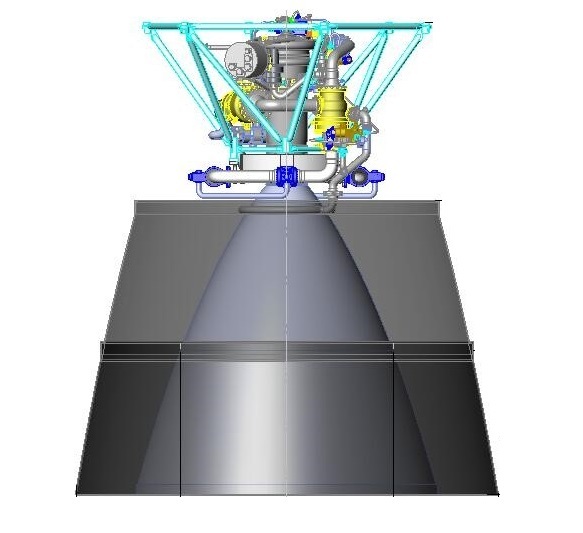 The engine compartment is not protected by the fairing and needs to be enclosed in a separable interstage section that builds the interface to the second stage, also including electrical and data interfaces. KVTK is approximately 10.4 meters long and 3.8 meters in diameter with a launch mass of 23,530 Kilograms. It uses cryogenic propellants – liquid Oxygen and liquid Hydrogen for its main propulsion system centered around the RD-0146D engine. Hypergolic propellants are used for the propellant settling thrusters and the attitude control system. Helium is used for tank pressurization stored in spherical high-pressure tanks. The tanks of the KVTK upper stage are made of aluminum alloy using spherical bulkheads with a cylindrical section between the bulkheads capable of holding 19,600kg of cryogenics. The tanks use insulation materials (isolane and screen thermal vacuum insulation) and the propellant lines are covered with insulation as well. This is required to prevent an excessive boil-off inside the tanks which is a problem during extended flight profiles. KVTK uses separable connectors for the LOX/LH2 and Helium fill & drain systems that interface with ground support equipment on the launch pad and separate a liftoff. Ground purge flow is directed into the engine compartment and the payload fairing as part of KVTK’s fire prevention system. These interfaces also separate at launch. With the second stage, KVTK communicates using umbilical connectors that are separated at staging and communication with the spacecraft is accomplished through interfaces on the payload adapter. 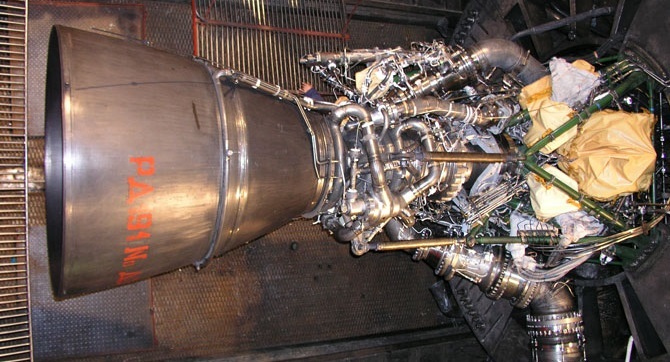 The RD-0146D engine is based on the original RD-0146 built by the KBKhA design bureau in cooperation with Pratt & Whitney Rocketdyne to design a Russian-equivalent to the RL-10 engine that is used to power the Centaur Upper Stage (Atlas) and the Delta Cryogenic Second Stage (Delta IV). 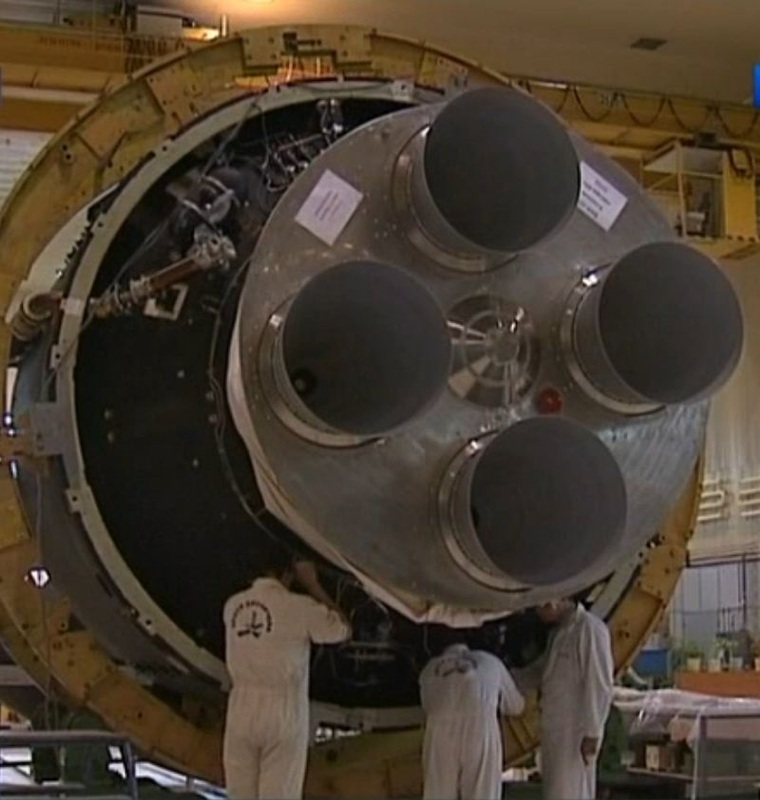 RD-0146 is the first Russian engine not using a gas generator and the first to feature a deployable nozzle extension. Development of the RD-0146 engine started in 1997 at KBKhA and was partially financed by Pratt & Whitney Rocketdyne, giving the company the international marketing right of the engine. 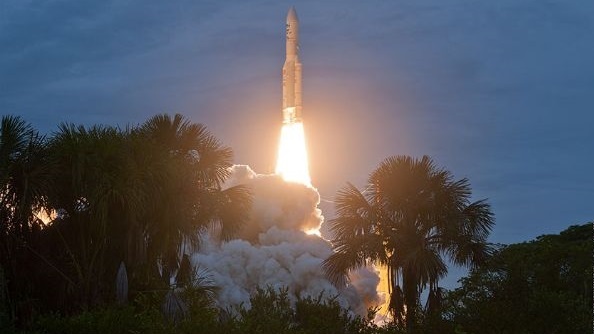 This marked the first step toward Russia’s return to fully cryogenic rocket fuel since the Energia rocket demonstrated the difficulty to control the LOX/LH2 combination in the 1980s. It also is KBKhA’s first engine with separate turbopumps, stepping away from the single-shaft design. The design of the engine was finished in 2001 and the first components had already been produced by then including ball valves with minimal leakage for Hydrogen. First, engine components were tested individually, such as the igniter. Late in 2001, the first RD-0146 was test fired to start its test program that was completed in 2007. RD-0146 is an expander cycle engine delivering 98.1 Kilonewtons of thrust with a nozzle optimized for operation in vacuum to create a specific impulse of 463 seconds. With the basic RD-0146 design and development complete, efforts to extend the engine’s capabilities were started to create the RD-0146D with deployable nozzle extension and multiple ignition capability, and the RD-0146DM that uses Liquid Natural Gas instead of liquid hydrogen. 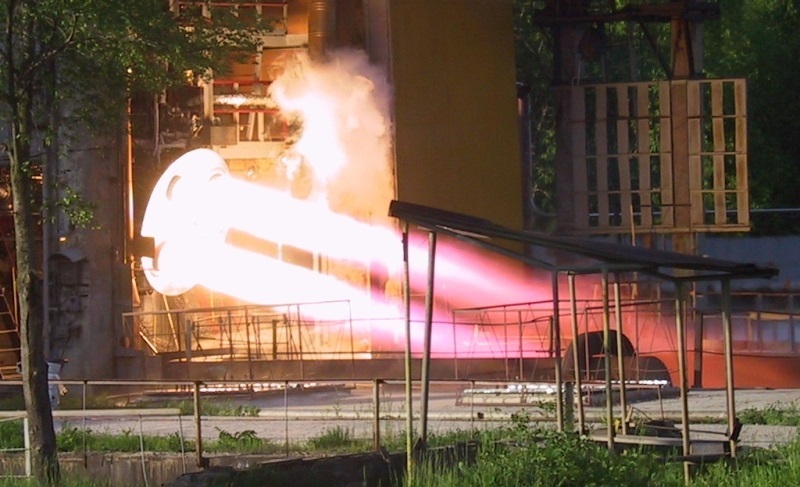 RD-0146D has a lower thrust than the original version, but a higher vacuum impulse due to the use of the extended nozzle – it also supports long burns of more than 1,300 seconds. 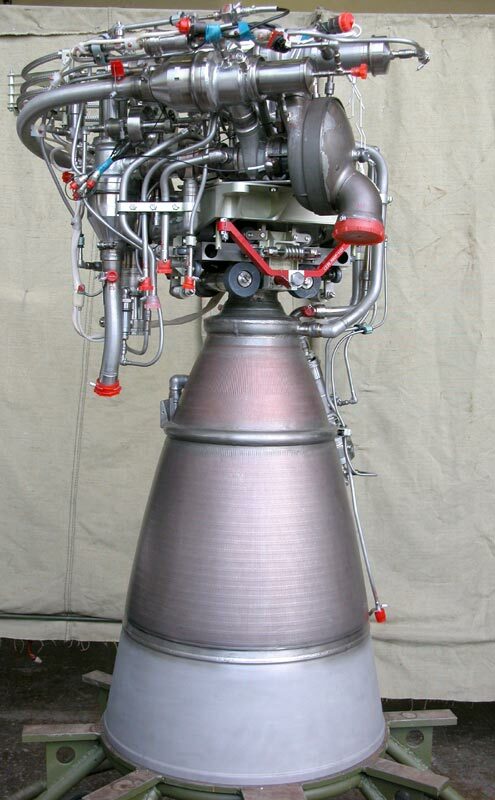 The RD-0146DM variant has a lower thrust and impulse due to the different propellant combination and has not yet been certified for long burns. The D and DM versions began development in 2007 & 2008 – the first test firings began in 2012. The RD-0146D completed vacuum testing, multiple ignition tests and tune-up testing in 2013 to be certified for use in 2015. RD-0146D stands about 3.56 meters tall with its nozzle extension deployed, creating a nozzle diameter of 0.96 meters and a nozzle length of 1.95 meters. The engine weighs about 242 Kilograms and delivers a vacuum thrust of 68.6 Kilonewtons (7,000kgf) at a vacuum impulse of 470 seconds. The engine uses regenerative cooling on its chamber and fixed nozzle segment while the deployable nozzle is cooled radiatively. The carbon-carbon nozzle extension uses an electromechanical deployment mechanism. RD-0146D uses an expander cycle that is very different to the staged combustion cycle of gas generator engines. In its principle, the engine expands the hydrogen fuel by running it through the engine heat exchangers to cool the chamber before entering the combustion chamber and being burned with the oxidizer. The engine uses ball valves in the LOX and LH2 feedlines as engine inlet valves before the propellants run through boost pumps with separate units for the fuel and oxidizer. These boost pumps allow the propellants to be supplied at low pressure (5.1 bar for LOX & 5.7 bar for LH2) and increase the flow and pressure to sufficient levels for the main turbopumps. The LOX boost pump is operated by a small stream of high-pressure LOX that is taken from the turbopump output, driving the boost pump turbine and being introduced into the LOX flow downstream of the boost pump to enter the cycle again. On the LH2 side, the boost pump turbine is spun by a high-pressure hydrogen stream that is taken from the expanded gas after passing through the turbopump and engine heat exchanger. After passing the boost pumps, the liquid Oxygen reaches its impeller turbopump that increases the pressure to approximately 130 bar. The LOX turbopump is driven by a turbine that is powered by the hot hydrogen gas from the LH2 turbopump heated & expanded in the heat exchangers. Some of the turbopump output is routed to the LOX boost pump while the rest is directed to the combustion chamber via a regulator for throttle control and a main oxidizer valve. The regulator controls the mixture ratio that is commanded by the engine controller and ensures fuel-rich conditions for start-up and shutdown to maintain chamber integrity. RD-0146 operates at a nominal mixture ratio of 5.9. The LH2 system uses a two-stage turbopump to reach fuel outlet pressures of around 260 bar. The entire liquid Hydrogen output from the pump is passed through a regulator valve inside the heat exchanger circuit of the engine that cools the combustion chamber and fixed nozzle section and gasifies the hydrogen – rapidly expanding it to be able to drive the pumps and to be injected into the chamber as a gas. After passing through the heat exchangers, the gas has a temperature of 280 to 300 Kelvin. First, the hot gas passes through the LOX turbopump turbine before reaching the LH2 turbopump turbine. The two LH2 pumps are mounted on a single shaft driven by one turbine assembly. The turbines can be bypassed by routing the hot gas through a dedicated pipeline via a regulator to be able to control the turbine speed and engine thrust level. 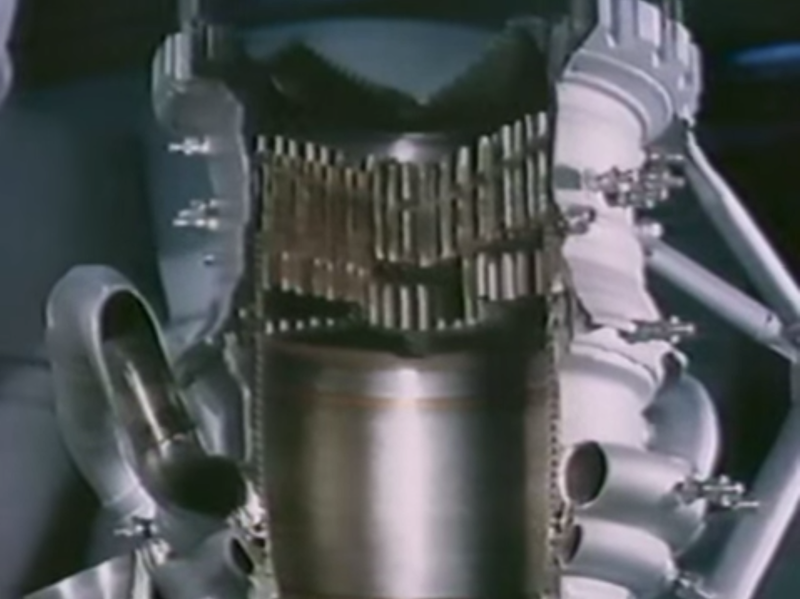 A small fraction of the gaseous hydrogen flow is directed to the LH2 boost pump turbine while the rest is injected into the combustion chamber along with the oxidizer. The combustion chamber uses 200 coaxial injectors to introduce the propellants into the combustion chamber and ensure a stable combustion process. RD-0146D operates at a chamber pressure of around 60 bar with an operational range of 40 to 112.5%. Combustion efficiency of the injectors is approximately 99.5%. For its regenerative cooling scheme, the chamber features an elongated cylindrical section that has over 200 longitudinal fins on its outside to be able to transfer the heat to the hydrogen that is flowing past. The fins reach temperatures of up to 900K. The turbopumps of the RD-0146 can spin at up to 123,200rpm, but the RD-0146D only requires pump speeds of around 98,180rpm. For engine start, a hydrogen-rich mixture is injected into the chamber and ignited with an electric-plasma igniter that operates under low-pressure with excess oxygen. The igniter allows up to five re-starts in flight. Once the fuel-rich mixture is ignited, the engine is operated fuel rich at a reduced thrust level for some time to allow the turbopumps to spin up so that a stable combustion process can be achieved for the throttle-up to 100%. Shutdown is also completed in fuel-rich conditions. To prevent cavitation, the engine is chilled down ahead of each start. RD-0146 uses pneumatic and electromechanical actuators for all of its valves and regulators. The engine also uses a number of pressure, temperature and flow-rate sensors to provide real-time insight into engine health, allow the engine controller to monitor the state of the engine and make adjustments of the mixture ratio and to enable detailed post flight analysis of the engine’s performance. RD-0146 uses nickel-based alloys and titanium and aluminum alloys for the chamber, the turbopump housing and the various pipelines. Stainless steel with coatings are used for turbopump blades. The RD-0146D engine can be gimbaled in two planes by up to +/-4 degrees to provide pitch and yaw control during powered flight while roll control is provided by the reaction control system. The KVSK upper stage uses a propellant settling thruster system and an attitude control system consuming hypergolic propellants – Unsymmetrical Dimethylhydrazine and Nitrogen Tetroxide. 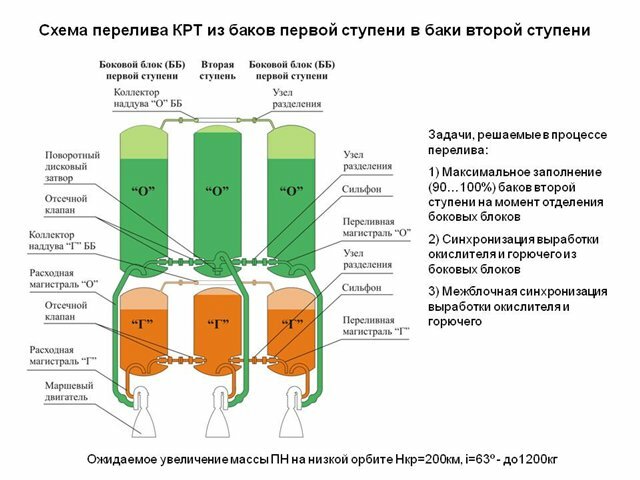 The propellants are stored in spherical high-pressure tanks that use a bladder pressurization system supplied by the Helium tanks of the KVSK stage. 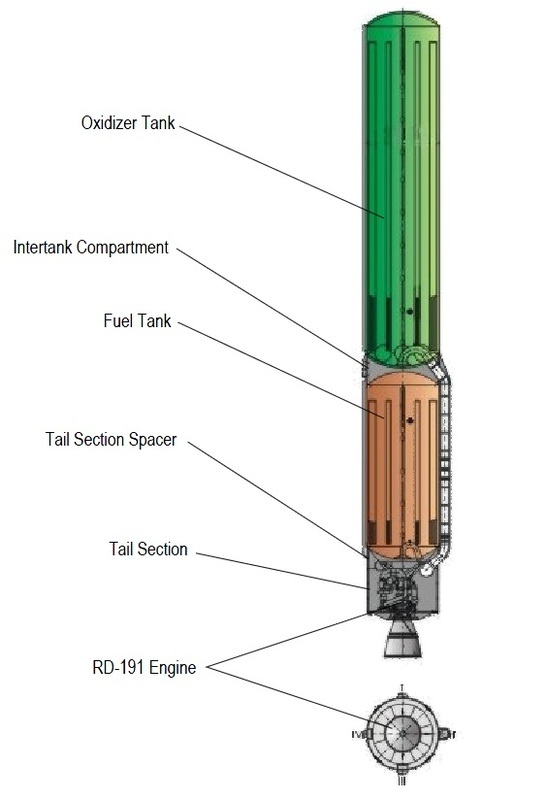 For propellant settling inside the tanks, eight thrusters are installed on the vehicle to ignite before a main engine burn (10-15 seconds) to provide an acceleration to the vehicle so that the propellants inside the stage’s tanks reach a two-phase composition ensuring that only liquid propellants enter the main engine. These eight thrusters are 11D28A engines which are also used as DPO-A orbit correction and attitude control thrusters on the Soyuz spacecraft. Each thruster delivers 130 Newtons of thrust (13.3kgf) measuring 24.7 centimeters in length and 9.3 centimeters in diameter with a mass of 1.5 Kilograms. The thrusters have a specific impulse of 290 seconds and can be operated in pulse mode for attitude control and steady-state mode with burns up to 2,000 seconds for propellant settling. The eight settling thrusters can also be used for insertion accuracy optimization after main engine shutdown. Eight S5.142A attitude control thrusters are installed on two thruster modules located in the engine compartment to provide three-axis attitude control during non-propulsive flight phases and control about the roll axis during main engine firings. Each of these thrusters delivers 25 Newtons of thrust and can be operated in pulse and steady-state modes. The KVSK upper stage uses a control system similar to the Briz-M. This equipment is housed inside a compartment at the top of the stage and interfaces with all components of the upper stage to be ale to control all stages of the flight. Navigation data is provided by a three-axis inertial guidance platform and vehicle control is accomplished by a redundant flight computer system. The system is autonomous and requires no uplink of data, but includes communications equipment to downlink telemetry via direct ground station passes or via the Luch satellite communications system. KVSK uses batteries to supply power to its various systems and is capable of executing missions of up to nine hours. Briz-M is a hypergolic upper stage developed for the Proton Rocket allowing access to a variety of orbits including Geostationary Transfer Orbit, Geosynchronous Orbit, escape trajectories and all types of lower orbits. 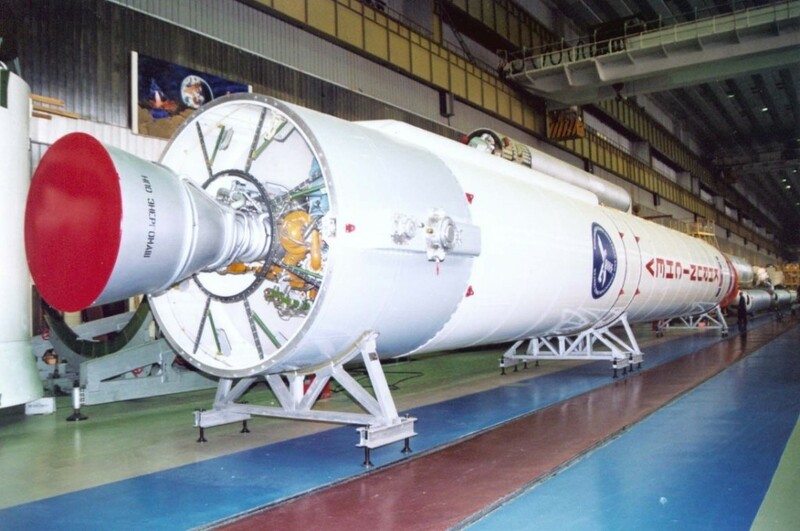 Due to its propellant combination and low-performance engine, the payload capacity of Angara with Briz-M are much smaller than with the cryogenic upper stage. Briz was developed on the basis of an anti-satellite propulsion system studied in the 1980s and first flew as Briz-K before being developed into the smaller Briz-KM for the Rockot launcher and its larger sister, the Briz-M, for Proton missions. Briz-M first flew in 1999 and the KM version made its debut in 2000. Briz-M is 4.0 meters in diameter and 2.61 meters in length consisting of a central block that houses propellant tanks, the engine compartment, pressurization systems and the flight control system. The Core Section is 2.49 meters in diameter. A toroidal tank section installed around the core vehicle carries additional propellants and is jettisoned after being emptied. In total, Briz-M weighs around 22,300 Kilograms including 5.2 metric tons of propellants stored in the core module and 14.6 tons of propellants carried in the Auxiliary Propellant Tank. The Central block consists of an oxidizer tank on top of the fuel tank, both are separated by a common bulkhead. The tanks include hydraulic and pneumatic systems as well as internal baffles to prevent propellant sloshing inside the tanks. Structurally, the tanks are toroidal in shape, leaving a cavity at the bottom to provide space for the main propulsion system in order to minimize the length of the stage. Below the tanks, the engine compartment features the main propulsion system, settling and attitude control thrusters, spherical helium pressurant tanks and spherical high-pressure propellant tanks for the settling and attitude control systems. The tanks are coated with screen vacuum thermal insulation to avoid excessive cooling of the propellants that affects viscosity and can lead to freezing the lines and tanks. On top of the Central Block is the equipment section of the Briz-M that is housed in an inverted truncated cone that features sub-frames to provide installation surfaces for the various controllers, telemetry modules, batteries and communications systems. Installed on the top frame of the Central Block is the payload adapter that provides the structural attachment point of the spacecraft and also includes communication interfaces. Payload adapters up to 2.49 meters in diameter can be supported. At the bottom of the Central Block is a 60-centimeter long adapter section that builds the structural interface between the Briz-M and the second stage of the launch vehicle and also provides attachment points for the payload fairing to transfer loads from the fairing and house separation equipment. This interstage section is separated with the second stage. Briz-M is encapsulated in the payload fairing of the launcher and reduces the available payload envelope. The Auxiliary Propellant Tank is mounted to the Central Block via a number of structural struts. Umbilical Interfaces are used to transfer propellants, power, and data between the two components. The toroidal compartment with cylindrical shells is divided into two separate tanks by an intermediate bulkhead creating an oxidizer tank (top) and fuel tank (bottom). Loads from the vehicle are transferred to the APT via the load-bearing cone inside the oxidizer tank and the outer cylindrical shell of the fuel tank. The tanks also include baffles to dampen propellant sloshing. Once the 14.6 metric tons of hypergolics inside the APT are consumed, the tank section is jettisoned by initiating pyrotechnic bolts that cut the structural attachment points of the APT. Electrical and fluid connectors automatically disconnect at separation and spring pushers initiate the clean separation of the APT that is ensured by guide rails and roller supports on the tank and Central Block. Briz-M includes two propellant systems – one low-pressure system for the main engine and a high-pressure system for the settling thrusters and the attitude control system. Both use Unsymmetrical Dimethylhydrazine as fuel and Nitrogen Tetroxide as oxidizer. These hypergolic propellants ignite immediately when coming into contact. Briz-M uses a single S5.98 main engine that delivers 19.62 Kilonewtons of thrust (2,000kgf) and is based on an open cycle design. 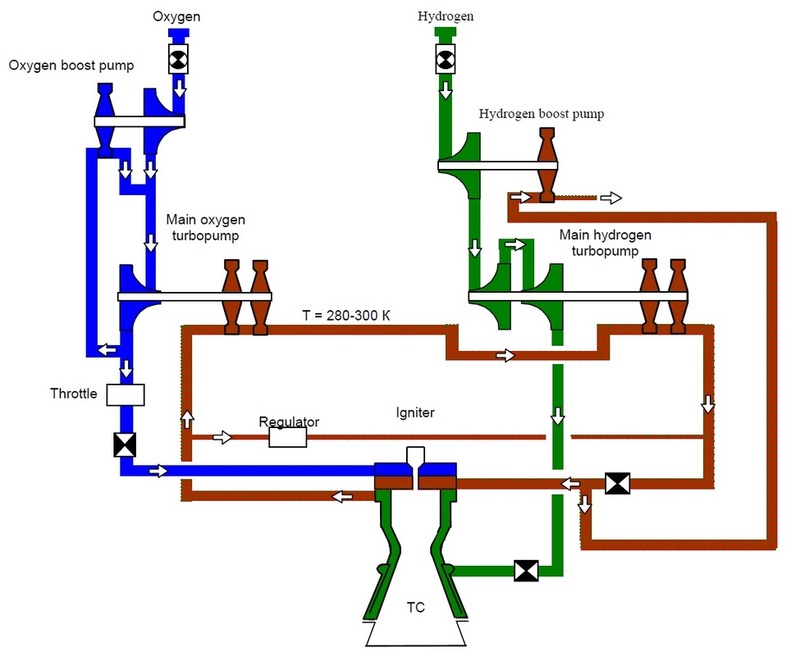 In this propulsion scheme, a small amount of oxidizer and fuel are injected into a gas generator that creates a high-pressure hot gas consisting of combustion products. This high-pressure gas feed is used to drive the turbines of the turbopumps of the fuel and oxidizer to deliver high-pressure propellant components into the combustion chamber. Regenerative cooling is accomplished by flowing propellant through the engine heat exchangers that cool the combustion chamber and warm up the propellants to temperatures where they have favorable physical properties. S5.98 operates at a chamber pressure of 95 to 98 bar and uses a propellant mixture ratio of 1.96 to 2.04. It generates a specific impulse of 328.6 seconds. Overall, the engine is 115 centimeters long and 94.8 centimeters in diameter weighing 95 Kilograms. S5.98 can support up to eight re-starts in flight. S5.98 is protected by a cover that is opened for main engine burns and protects the engine during coast phases using a hinged opening mechanism. 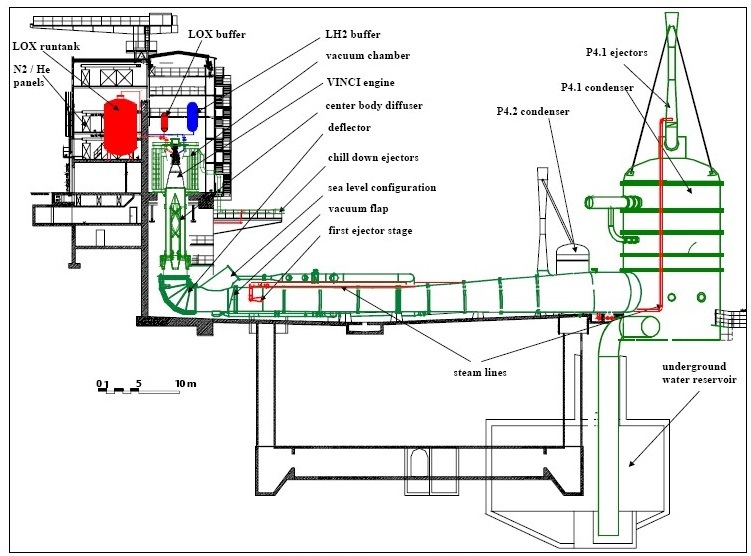 The propellant settling system is comprised of four 11D458M thrusters installed on four thruster pods located on the aft end of the Central Block. These pods include one settling thruster and three attitude control engines connected to the same propellant supply. Also consuming hypergolic propellants, the settling and attitude thrusters use propellants supplied by the high-pressure system. Each settling thruster delivers 392 Newtons of thrust being 46.9 centimeters long and 19.2 centimeters in diameter with a mass of about 3 Kilograms. 11D458M operates at a mixture ratio of 1.85 and a propellant inlet pressure of 14.7 bar. It can be fired in pulse mode or make long steady-state burns and is certified for firings of up to 1,000 seconds and 10,000 duty cycles. 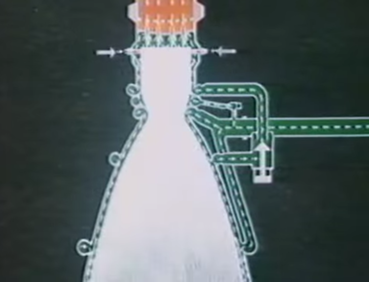 For propellant settling, all four thrusters are activated 15 seconds before the main engine start to provide a forward acceleration for propellant settling inside the large tanks. The attitude control thrusters used on Briz-M are known as 17D58E providing a nominal thrust of 13.3 Newtons. Each unit is 14 centimeters long and weighs 550 grams. The thruster also operates at a mixture ratio of 1.85 and a nominal inlet pressure of 14.7 bar, but it can tolerate a large pressure range from 7.8 to 34.3 bar. For attitude control, the thrusters are used in pulse mode with a minimum on-time of 0.03 seconds, but 17D58E is also certified for burns in steady-state mode up to 10,000 seconds. The engine is certified for 450,000 duty cycles. Briz-M is outfitted with an inertial guidance platform, a digital flight computer and batteries that allow the stage to operate for up to 24 hours. The Payload Fairing is positioned on top of the stacked vehicle and its integrated Payload. It protects the spacecraft against aerodynamic, thermal and acoustic environments that the vehicle experiences during atmospheric flight. When the launcher has left the atmosphere, the fairing is jettisoned by pyrotechnically initiated systems. Angara A5 uses different fairings depending on the Upper Stage that is being used. For missions using the Briz-M, the vehicle uses a fairing similar to that of the Proton launch vehicle – 4.35 meters in diameter and 18.84 meters long. 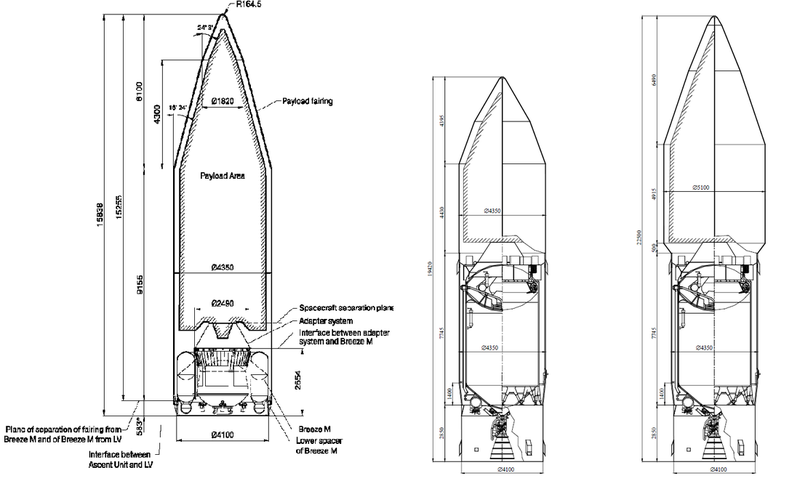 If the KVTK Upper Stage is used, a two-part fairing is employed – the lower section is cylindrical and protects the KVTK upper stage while the upper fairing encloses the payload. The KVTK fairing is 4.35 meters in diameter and 7.75 meters long, covering the upper section of the KVTK stage. 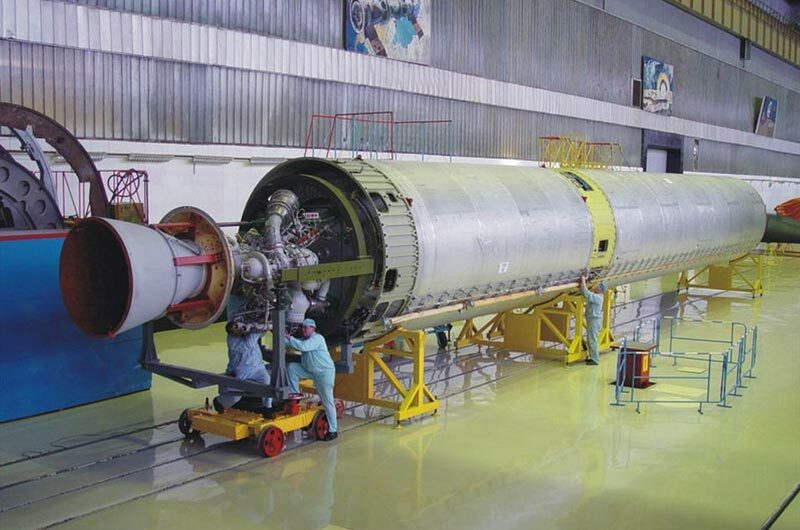 The engine compartment and lower section of the LOX tank are not protected by the fairing and need to be accommodated in the interstage adapter between the second stage the the Upper Stage that also widens in diameter from the URM-2’s 3.7m diameter to 4.35 meters. Attached to the KVTK fairing is the actual payload fairing that encloses the usable payload volume. Two fairing options are available – one 4.35-meter fairing that is 8.87 meters long and a larger fairing 5.1 meters in diameter and 11.41 meters long requiring an adapter between the 4.35m KVTK fairing and the payload fairing. The fairings consist of a three-layer cylindrical shell with a double-cone upper section made of polymer materials. As part of the evolution of the Angara launch system, Khrunichev plans to implement propellant crossfeed capability to significantly enhance the capabilities of the A3, A5 and A7 launch vehicles. 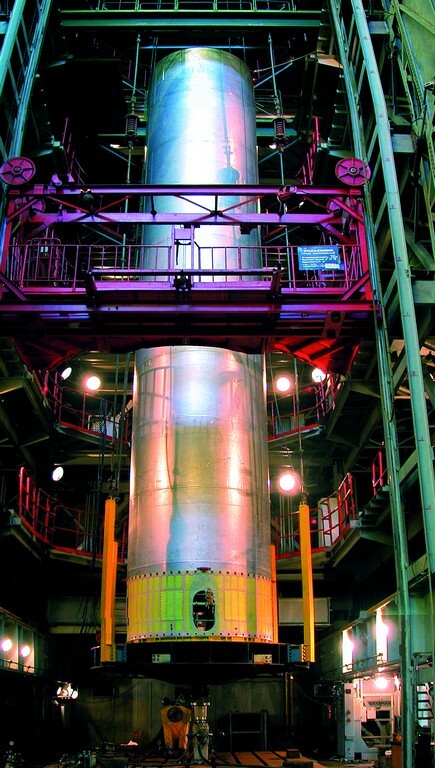 Propellants are transferred from the strap-on boosters to the Core Stage to allow its tanks to be at 90 to 100% when the strap-ons separate thus increasing its burn time following staging – optimizing the throttle profile of the flight.